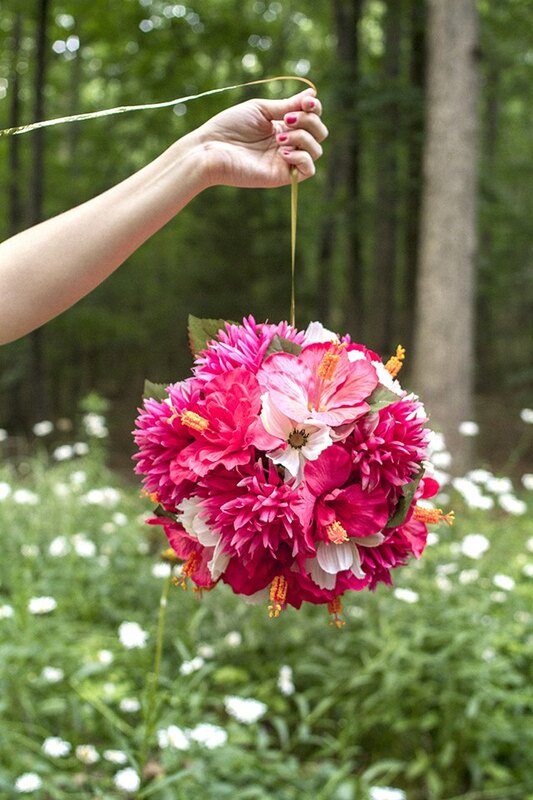 Add a splash of custom color and texture to your party or wedding with a series of handmade hanging flower balls. Whether you choose to use silk flowers (as shown in this tutorial) or fresh flowers, the effect of this hanging décor will be a striking addition to your event. Because it takes only about 30 minutes to complete each hanging ball, you can even invite your friends over and make a whole batch in one day. Unwind a length of wire about 2 feet long from the spool of floral wire. You can cut it off the spool now with wire cutters or leave it intact and trim after you have it wrapped around the ball — it's up to you. Pierce the foam ball with the end of the wire, pushing it about 2 inches down into the body of the ball. Wrap the wire around the circumference of the ball and, when you reach the beginning again, trim the wire so that there is about 2 inches of extra wire. Push the excess 2 inches of wire down into the foam body just to the side of the first pierce. Do not use the same pierced hole as before to attach this opposite end of the wire or else it may come loose because the opening in the foam will be too big. 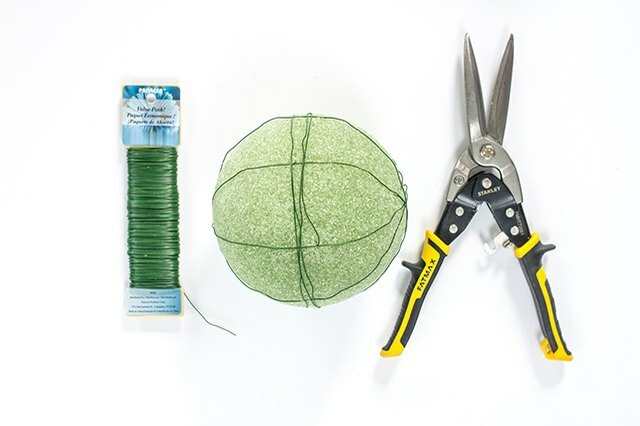 Repeat the same steps to add a series of wire wrappings to the foam ball. You'll want four wrappings in all, with about 1 to 2 inches of space between each wrapping at the widest parts on the side of the foam ball. The reason for the multiple wrappings is that wrapping one long piece of wire around the ball in multiple directions and paths eventually loses strength. Wrapping them one at a time results in the tightest configuration. 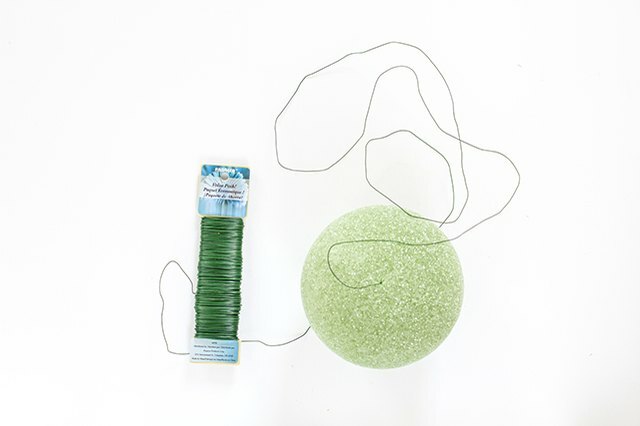 Unravel a 3-foot section of wire off the spool and pierce the end 2 inches into an area at the middle of the foam ball where the previous wire wrappings are at their furthest from one another. Wrap the wire tightly around the ball several times, thereby pressing the concentric wire wrappings tightly to the foam ball. When you run out of wire, push the opposite end of the wire into the foam ball at a 2-inch depth. Use scissors to cut off a piece of ribbon. This will be used to hang the flower ball. 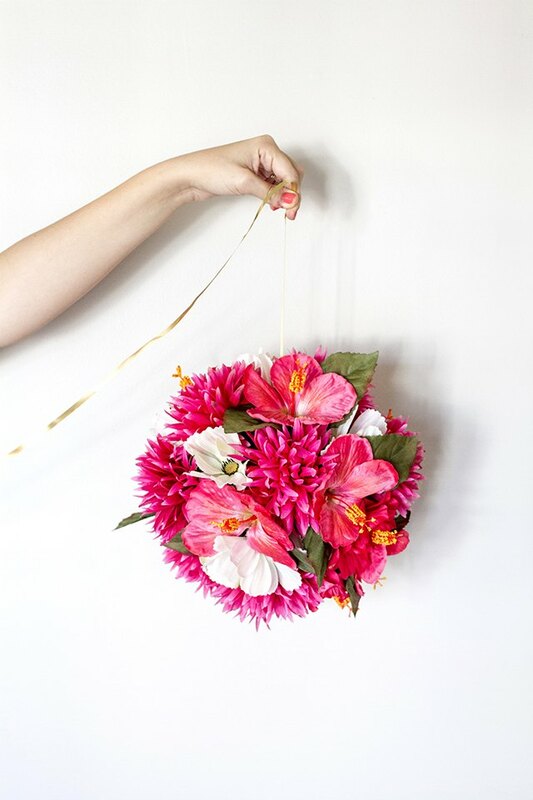 If you aren't sure how high you'll want the flower ball to hang, add an extra 1 to 2 feet to the length of the ribbon and trim it later when you hang it. Slip one end of the cut ribbon under the first set of wire wrappings right where they all meet on an end. Tie the ribbon in a simple double knot and trim off the excess if needed. Be sure to slip the ribbon under at least three of the wire wrappings so that the weight of the flower ball is distributed evenly when hung. 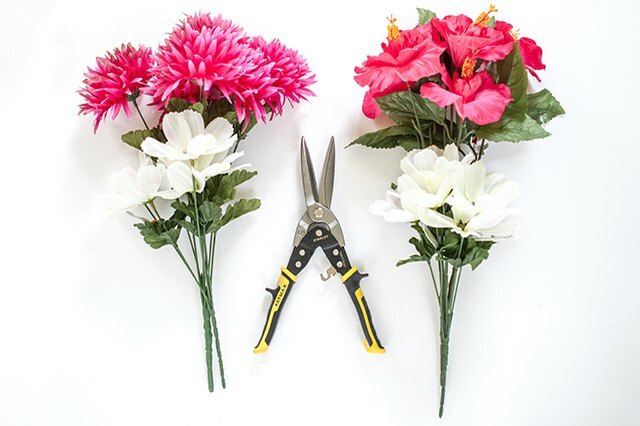 Use wire cutters to trim the buds of the silk flowers off of their stems. Leave 2 to 3 inches of the stem exposed off the end of each flower so that you can use it to pierce the ball in the next step. Pierce the stems of each flower into the foam ball in between the wire wrapping to attach them to the hanging ball. Push the flower all the way in to ensure that it won't budge. Although typically not necessary, if you feel like the flowers aren't attaching well enough to the foam, you may use hot glue to further adhere them to the ball form. Depending on the size of your flowers' petals, you may leave about 1 to 2 inches between each flower— the petals will cover the foam so that you don't see it through the flowers. Alternate flower bud types and colors so that you achieve variety and dimension. If you plan to use fresh flowers, you will need to add floral picks to your supply list. 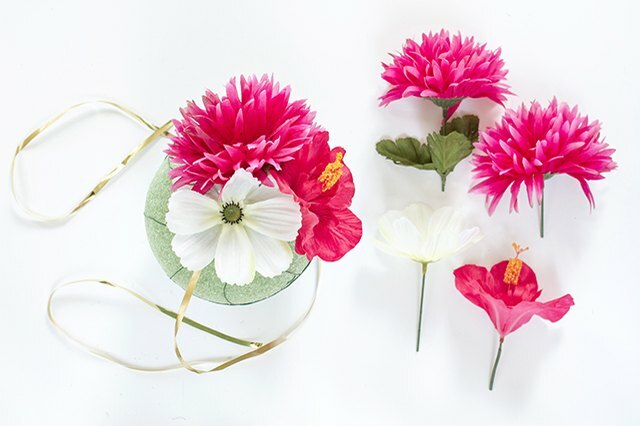 Attach the picks to the stems of the flowers using floral wire, and use the sharp end of the pick to pierce the foam, thereby attaching the flower to the body of the foam form. 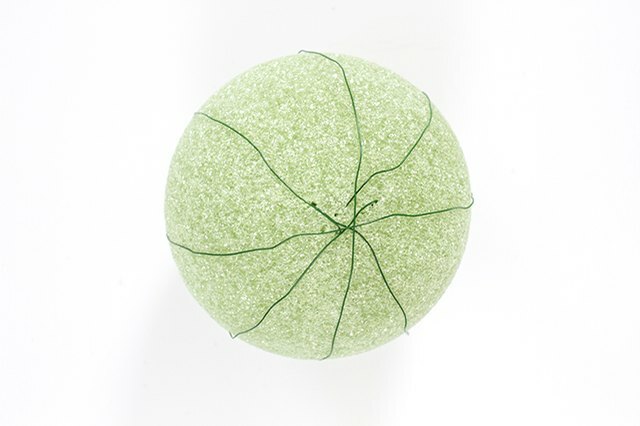 Repeat the steps on additional foam ball forms if you plan to hang a variety of flower balls at your wedding or party. 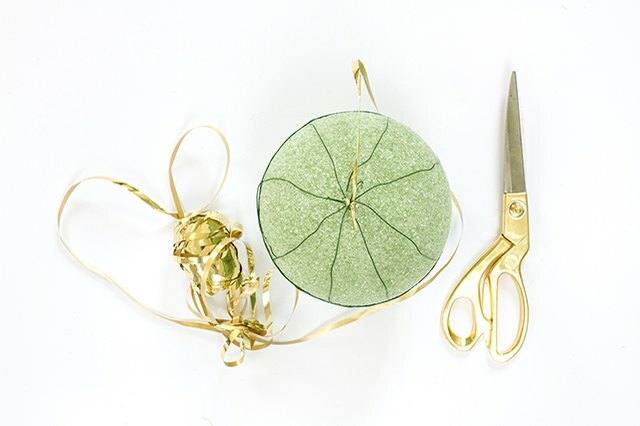 To hang, simply wrap the opposite free end of the ribbon of each flower ball around a tree branch or hook.